Processing: Images were captured in K3CCDTools. Aligned/stacked in Registax and saved as FITS. Luminance and Color channels were scaled and rough color balanced in Astroart. Channels were co-registered in Astroart. The Nebulosity was extracted from HA and then combined with the 60 sec IR for Luminance in Photoshop - The 16 sec IR was used to minimize some star bloating. 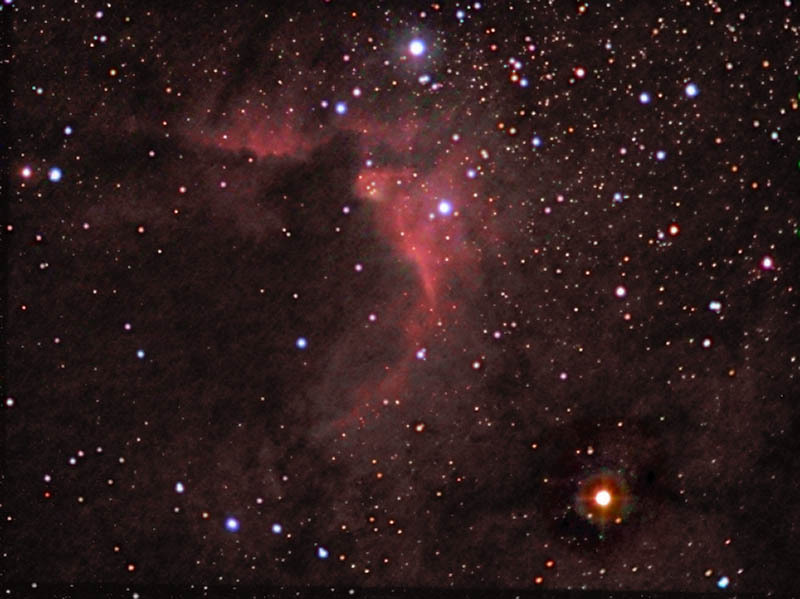 Extracted nebula from HA was used to provide a very small amount of false color for the nebula in the Red channel. Luminance and Color FITS were combined in Photoshop with Luminance Layering. Color balancing and final touches in Photoshop. SGBNR (PixInsight LE) was used to smooth background noise on Luminance channel as well as the final result. Image was resized to 800 x 600.